Spray on sealant for your matte wheels! Dr. Beasley’s Matte Wheel Seal is a high-tech wheel coating designed specifically for matte wheels and will prevent the build-up of brake dust and road grime. Featuring an extremely high heat resistance, Dr. Beasley’s Matte Wheel Seal will last even under intense heat and use! Dr. Beasley’s Matte Wheel Seal provides absolutely no shine to matte wheels – it just protects! Due to extremely high temperatures generated by your wheels, finding the right coating or sealant for your wheels’ finish can be tough. Compound that with having a matte wheel finish and you may be searching for ages! But not anymore – Dr. Beasley’s Matte Wheel Seal is designed, as the name suggests, for matte wheels and will protect against brake dust, etching, pitting, and paint erosion! Dr. Beasley’s Matte Wheel Seal is as easy as spray on, wait, and wipe off! Brake dust is one of the hardest residues to clean when it comes to car detailing. If regular maintenance and the correct preventative measures are not taken, it can easily take you hours to clean out thoroughly! If not addressed, ferrous brake dust can cause etching, pitting, staining, and paint erosion. Dr. Beasley’s Matte Wheel Seal will provide a layer of protection between your wheels’ surface and this ferrous brake dust, preventing any damage! Matte finishes are quickly becoming one of the most popular features to have on your car, and matte wheels are no exception! Keep your matte wheels clean, brake-dust free, and protected with Dr. Beasley’s Matte Wheel Seal! 1. Before use, make sure your wheel is clean and dry. 2. Apply Dr. Beasley’s Matte Wheel Seal using a soft cloth or microfiber applicator. 3. Let the coating cure by leaving it on the surface for several minutes before using a soft microfiber towel to buff off. 4. 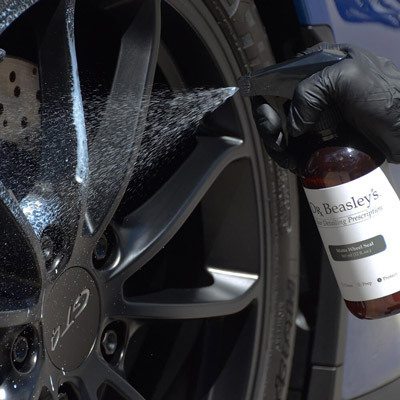 For maximum results, first clean your wheels using Dr. Beasley’s Matte Wheel Cleanser.